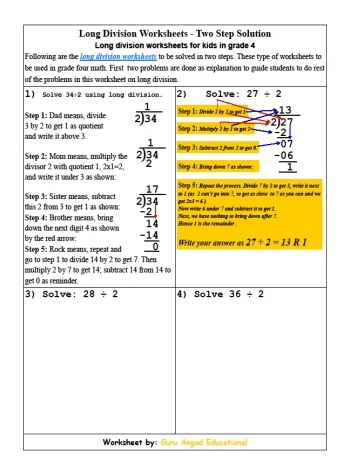 This page contains long division worksheets and lessons to master overall division skills. 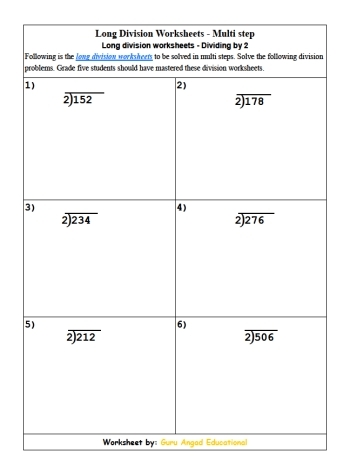 Kids in grade 4 and beyond can use our long division worksheets and lessons at this page. To learn how to work on long division problems, there are a set of requirements. Most of the requirements can be fullfilled by visiting the previous sections of this site. 1. Times tables or multiplication tables (at least fairly well). 2. Basic division without remainders based on times tables. 3. Basic division with remainder. 4. Math multiplication and division facts. Finally, we can conclude that the multiplication tables are the key to learn all the division skills. Please visit the basic division worksheets page and the math facts page to print the worksheets and lessons; give them to your kids to practice these basic skills. Make sure kids know the basic times tables to do long division. As usual, we are giving some lessons on long division before the worksheets. So, print the following lessons and give to your kids or students to learn long division. Hope that kids have learned the most of the long division using the above lessons on this key math operation. Now get ready for the long division worksheets. Now is the time to practice the long division using the worksheets given below. Print all the worksheets one by one and do all of the problems given in them. Once you done every single lesson and worksheet on this site, think yourself very proud as you have mastered one of the most important basic skill in math.